The nanofiber sutures used in the research contain 25-hydroxyvitamin D3 (25D3) and the pam3CSK4 peptide. A peptide is a compound consisting of two or more amino acids linked in a chain; pam3CSK4's function is to activate a cell's toll-like receptor, which in turn triggers immune responses, in which vitamin D plays a key role. The research, which was published in the journal Nanomedicine recently, showed the nanofiber sutures released 25D3 on a sustained basis over four weeks. The sutures released pam3CSK4 via an initial burst followed by a four-week prolonged release. "When the toll-like receptor is activated, you induce a particular enzyme to convert 25D3 to its bioactive form, known as 1,25-dihydroxy vitamin D3 (1,25D3), that activates the vitamin D receptor," Dr. Gombart said. "When activity increases, that increases expression of vitamin D receptor target genes, one of which produces the LL-37 peptide, which kills microbes by disrupting their membranes. "The idea is, if you were to have an infection, the sutures would activate the toll-like receptors and start increasing production of 1,25D3 from the 25D3 that's being released from sutures - so you get both local induction and an increase in the production of the antimicrobial peptide." Dr. Xie said the anti-infective sutures currently in use contain triclosan, an antibacterial and antifungal agent also found in a variety of consumer products. The nanofiber sutures can deliver a variety of bioactive compounds to minimize infection risk, optimize healing and minimize scarring, while circumventing some of the problems seen with anti-infective sutures containing triclosan. When used frequently, triclosan sutures have resulted in bacterial resistance, Dr. Xie said. In addition, the triclosan sutures also have a wide range of potential health risks including endocrine disruption, impaired muscle function, liver damage and the development of cancerous tumors. Jingwei Xie, Ph.D., a biomedical engineer at UNMC, has been awarded a four-year, $1.3 million grant from the National Institutes of Health (NIH) to study the nanofiber-based local delivery of immunomodulating compounds for prevention of surgical site infections (SSIs). The nanofiber sutures contain vitamin D, which is thought to be able to induce production of an infection-fighting peptide at the surgical site. If proven successful in transgenic mice, the nanofiber sutures could represent an important advance in the prevention of SSIs, a multibillion-dollar challenge each year in the United States. The R01 grant is through the National Institute of General Medical Sciences, one of the institutes of the NIH. 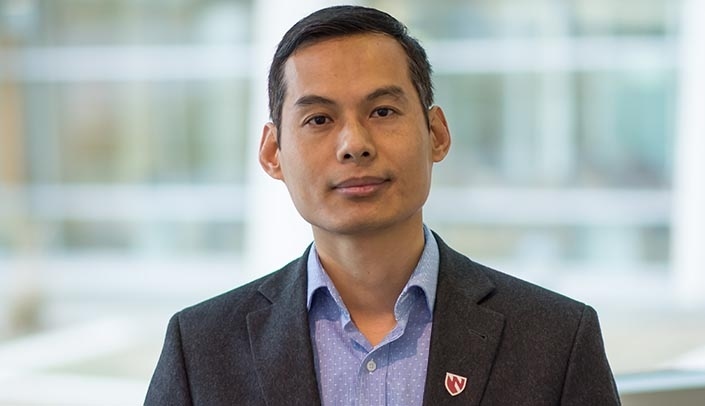 Dr. Xie, who is an assistant professor in the UNMC Department of Surgery - Transplant and the Holland Regenerative Medicine Program, is the principal investigator on the grant. He is collaborating with Adrian Gombart, Ph.D., associate professor, biochemistry and biophysics, in the Linus Pauling Institute at Oregon State University (OSU). OSU is conducting the testing on the humanized transgenic mice for its part of the study. "This is an exciting project," Dr. Xie said. "SSIs are a very common problem affecting as many as 300,000 patients per year in the U.S. If we could reduce these infections, it would be a major breakthrough." SSIs include infections in the area of the skin where the incision is made, infections below the incision in muscles and tissues surrounding muscles and infections in other parts of the body involved in the surgery. SSIs are the most common and costly of all hospital-acquired infections, accounting for 20 percent of all hospital-acquired infections. They occur in an estimated 2 percent to 5 percent of patients undergoing inpatient surgery. The estimated annual incidence of SSIs in the U.S. ranges from 160,000 to 300,000, and the estimated annual cost ranges from $3.5 billion to $10 billion. On average, a SSI increases the hospital length of stay by 9.7 days.